Foundation Masters, LLC designs Termite Resistant Homes in Florida. The best way to protect your home from termites is to use the right building materials. In areas where termites are active, total building protection against termite infestation is the only way to minimize the risk to the structure, the non-structural building elements and its contents. Protection against infestation can be achieved by appropriate design, care during site preparation, adoption of appropriate construction practices, and ongoing inspection and maintenance. Building a home in Florida one should always consider building a Termite Resistant Home. How Termite Infestation Occurs in Buildings. not offer protection against termites that may gain access via wall cavities and fine cracks in mortar or slabs. In rare cases, a nest may be established inside the building as an offshoot from an existing colony. This can occur where a source of permanent moisture is available to the termites within the building (e.g. leaking plumbing) and in this situation, there may be no contact between nest and soil. 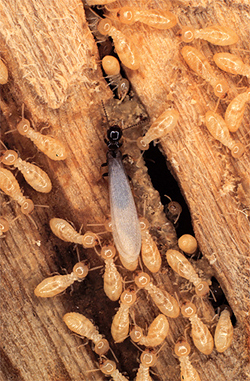 In general, entry into a building by winged termites does not result in colony establishment, as it is mostly from the soil that major termite infestations occur.